You have heard us blog about the USB missile launchers before excited about the prospect of making them into autonomous robot projects. 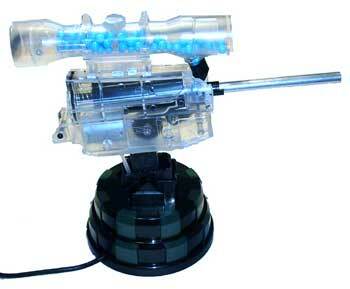 Now our giddyness has spiked to new levels with the appearance the InventGeek‘s USB Airsoft Turret project. Our issue before was the accuracy and range of the soft foam missiles on these USB toys. Jared and his brilliance solved this problem by removing the weak foam missile launcher and replacing it with an Airsoft pellet gun. NOW this is a project worth building. Full tutorial here. A big thanks to Jared for posting his project on the web. This entry was posted on Wednesday, January 24th, 2007 at 3:07 pm	and is filed under Featured Projects / Robots, Tutorials. You can follow any responses to this entry through the RSS 2.0 feed. You can leave a response, or trackback from your own site. This is a cool turret, I will look out for players running around on our fields strapping laptops to their backs pointing these airsoft guns at each other. Super cool turret, i imagine their could be alot of office paintball going on. Not much work though!